Mobile Virtual Reality is right here in VOMA! You wanna experience IMAX movies any time and anywhere? You wanna a real racing, marching in gunfire or shooing bullets in battlefield in 3D games? 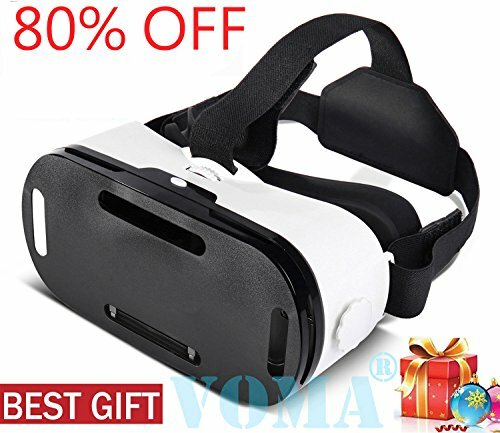 Just put on this VOMA VR glasses, it immediately drop you into the action ! Blue lights coming from mobile phones do damage to the eyes. With blue coating film, the lenses of this headset can reflect the blue light of your smartphone, safeguarding your eyes. Comfortably fits iPhones, Android phones, Windows phones with a screen size within 4.7 - 6.0 inches ( take off the removable mobile phone slot if the phone's size is larger than 5.2 inch). 1. Do not watch movies or play games with the 3D glasses for a long time. If your eyes feel tired, please have a rest. 2. In order to get a better visual enjoyment and field experience.It's better use a mobile phone with 1080P screen resolution or above and HD movie or game. 3.Pupil Distance (PD) and Object Distance (OD) Button need be rotated with Moderate force! [ Adjustable Pupil Distance and Object Distance ] : You can slightly adjust the position of the spherical resin lens through rolling the gear at a range of 58-76mm on the top of the 3D VR GLASSES so as to get a better experience of watching movies. You can get a viewing angle of 96 degrees/ FOV. Perfect for users with myopia problem within 0-800 degree and support 0-400 degree perspective adjustment. [ Protect Your Eyes ]: Blue lights coming from mobile phones do damage to the eyes. With blue coating film, the lenses of this headset can reflect the blue light of your smartphone, safeguarding your eyes. [ Wide Compatibility ]: Comfortably fits iPhones, Android phones, Windows phones with a screen size within 4.7- 6.0 inches ( take off the removable mobile phone slot if the phone's size is larger than 5.2 inch). [ Super Comfortable Silica Gel Eyepatch Design ]: Compared to other VR glasses with sponge foam eyepatch, VOMA ones with silica gel is more comforable, non-sweat-absorbent and sanitary. Ergonomic design ensures a balanced stress condition in three points on the head (concentrated on the forehead), reducing 30% pressure to the eyes. If you have any questions about this product by VOMA, contact us by completing and submitting the form below. If you are looking for a specif part number, please include it with your message.